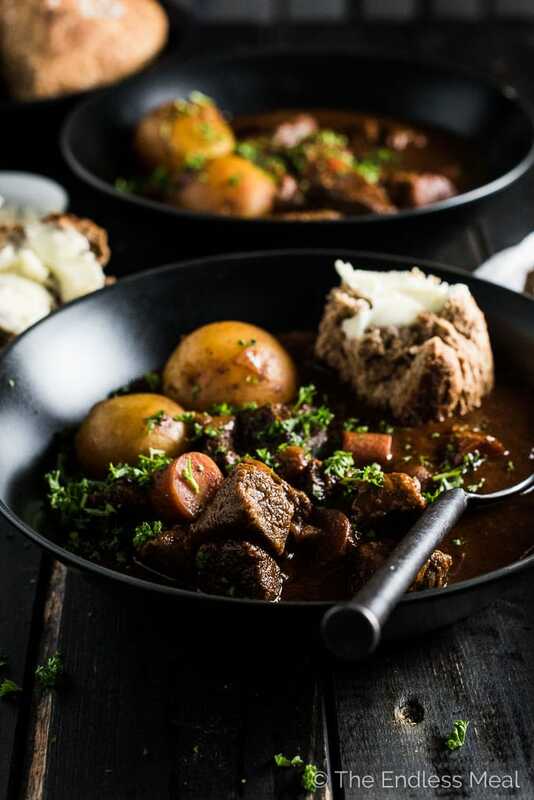 Just in time for St. Patrick's Day, but perfect for any day, is this Guinness Crock Pot Beef Stew recipe. I've snuck a little chocolate in here, too. I know it sounds strange, but you don't actually taste the chocolate; it simply adds a little richness to the stew. You will LOVE it! 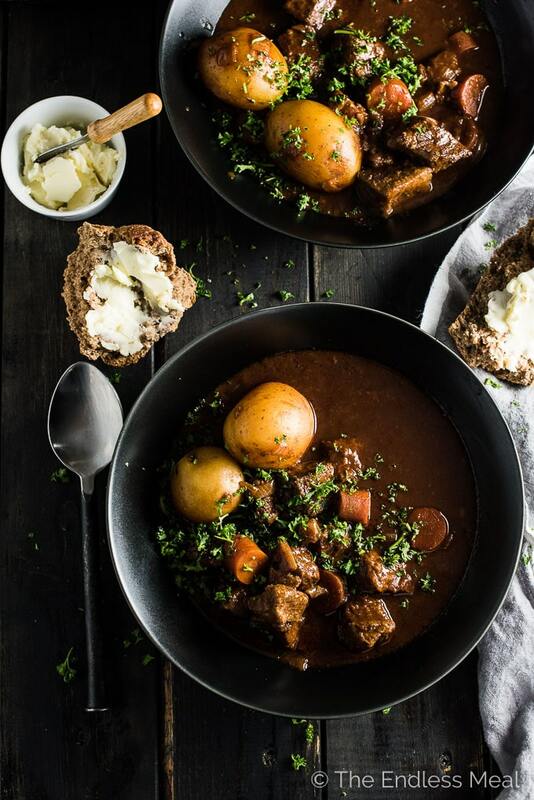 It's time to cozy up with a big bowl of stew, some well-buttered bread, and pull out our best Irish accents. Scratch that, my imitating accents game is weak. Like, you'd rather listen to nails on a chalkboard than me try about mimic an accent. It's that bad. 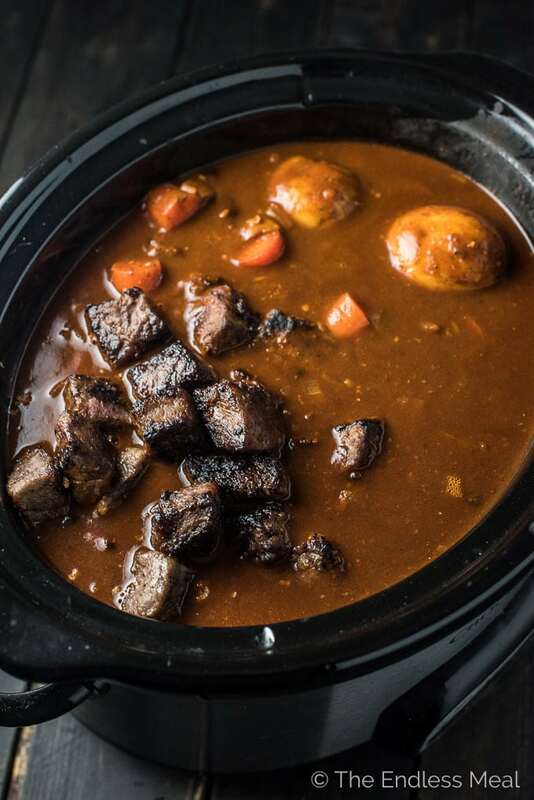 But who needs accents anyway when it's (almost) St. Patty's Day and you've got a steamy bowl of Crock Pot Beef Stew staring at you? I've kept the ingredients simple and traditional, with the exception of Guinness and chocolate. Yep, there's beer and chocolate in here, and it's awesome. 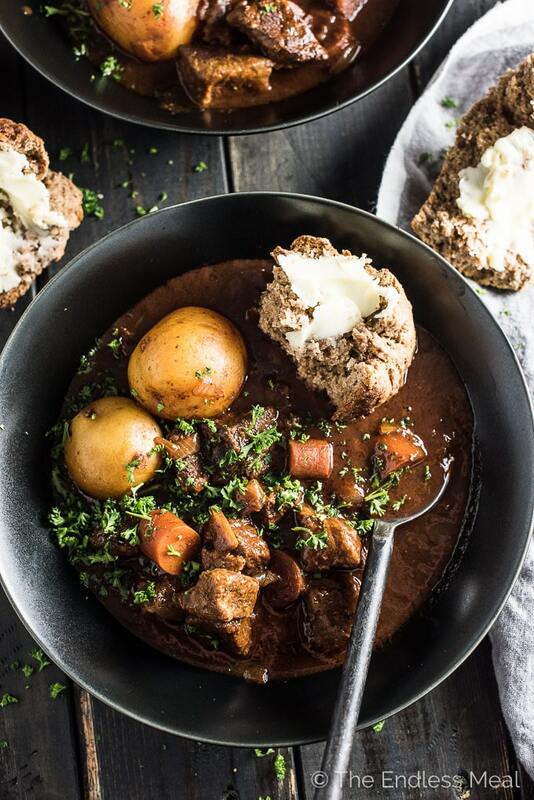 The beer adds a rich and almost earthy flavor to the stew that goes amazingly well with beef. And don't worry if alcohol is not your jam, nearly all of it evaporates as it cooks. Chocolate is that special something ingredient that you don't taste, but you know is there because the stew is extra delicious. It adds an extra layer of richness and depth. Sure, you can throw some beef and liquid into your crock pot, and it will come out a few hours later tasting pretty good. But the best beef stew has layers and layers of flavor. Don't worry, those layers are easy to create. Start by searing the beef. This is a no brainer. A good sear makes the meat look nicer, and adds extra flavor. You can technically skip this if you're short on time (been there!) it is totally worth the extra 20 mins it will add to your prep time. Make sure not to crowd the pan, so the beef sears brown instead of steams gray. No one wants gray meat. Also, don't be afraid to add extra oil if your pan is looking dry. It will help create the dark brown color you want and prevent the beef from burning. Use butter when you're searing the beef. Ever heard of brown butter? But of course, you have. It's delicious, coveted culinary gold and it's what will happen to the butter as the beef sears. Caramelize those onions. Onions turn sweet when they're well cooked. Don't be afraid to keep cooking them until they are very soft. Caramelize the tomato paste. More layers! The natural sugar in the tomato paste will caramelize, just like the onion. It usually takes about 2-3 minutes before the paste starts to darken a little and smell sweet. Use this same trick to add more depth to your tomato sauce next time you're craving spaghetti. Gelatin. I know that's a bit of a funny stew ingredient, but trust me on this one. Unless you're using homemade beef broth (major extra bonus points if you are! ), then you want the gelatin as it adds richness and gives the stew a beautiful full texture. If you know a little (or a lot) about wine, you'll be familiar with the term ‘mouth feel'. Gelatin is all about creating that mouthfeel that is missing with store-bought stock. Be a boozy cook. Take a sip (you deserved it) then pour the rest of that can of beer into your crock pot. Alcohol adds tons of flavor to whatever it is you're cooking, like this stew. Just make sure you like the flavor of the beer you use as you will taste it. Other great beers to use are non-bitter stouts and porters. Try a chocolate porter (Philip's Longboat Chocolate Porter is my fav!) for double chocolate in this recipe. And remember that most of the alcohol burns off as the stew cooks so this is safe to serve to little ones. Sneak in some chocolate. For reals, yo. Do you remember those Dark Chocolate and Stout Braised Ribs from ages ago? Still my fav recipe, btw. 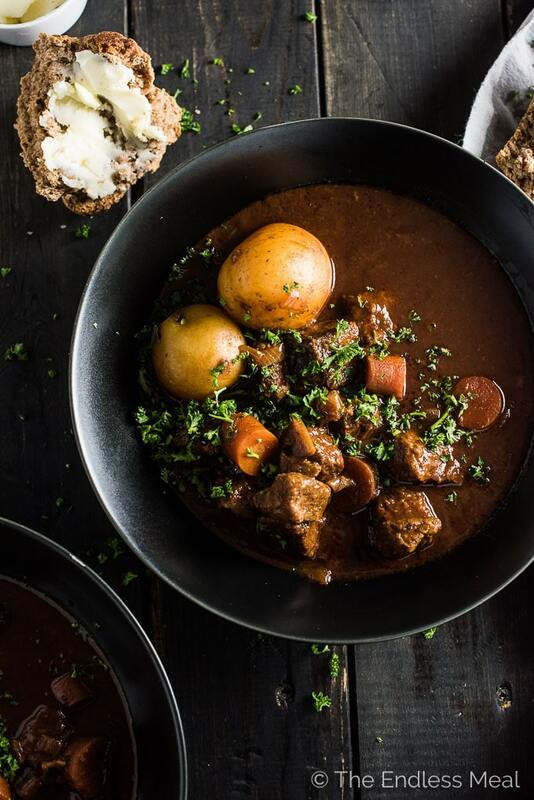 Just like in that recipe, adding a little dark chocolate to your beef stew will add a richness that you'll know is there, but won't quite be able to put your finger on what it is. 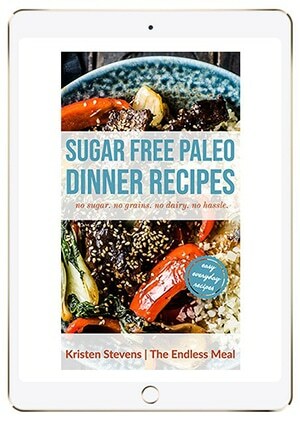 If you're cooking for skeptics, don't tell them and they'll never know. They'll just compliment you on your amazing stew making abilities. Now that you're a master at the art of making Crock Pot Beef Stew, will you call me over next time you're making a batch? I'll bring the beer! 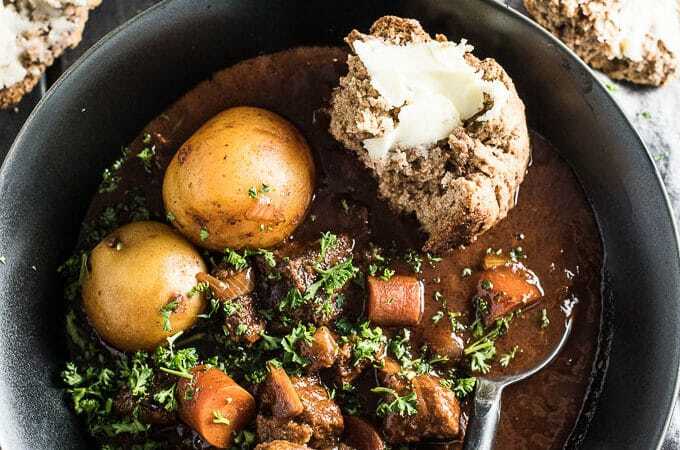 If you make this Chocolate Guinness Crock Pot Beef Stew make sure you snap a pic and tag #theendlessmeal on Instagram so I can like and comment on your photos. I love seeing TEM recipes you create! Place the beef into a bag and add the flour, salt, and pepper and shake the bag so that the beef chunks are all coated. Heat the oil and butter in a large frying pan over medium-high heat. Add the beef, working in batches so not to crowd the pan, and sear until well browned on all sides. Transfer to your crock pot. Add the onion, celery stalks, and garlic to the pan and saute until the onion is soft and starting to brown, about 5-7 minutes. Add the tomato paste and let it caramelize for 2-3 minutes, or until is starts to darken and turn sweet smelling. Transfer to the crock pot. Mix the gelatin into the beef stock then pour that into your crock pot along with the Worcestershire sauce, chocolate, carrots, potatoes, and Guinness. Set your crock pot to cook on low for 8-10 hours. I’m sorry you didn’t love it as much as we do! I really want to make this..but don’t have a crock pot. Can I simply cook in a low oven while at work? What temp would you recommend? This stew was so flavorful. My family loved it! The chocolate gave it just the right amount of richness. 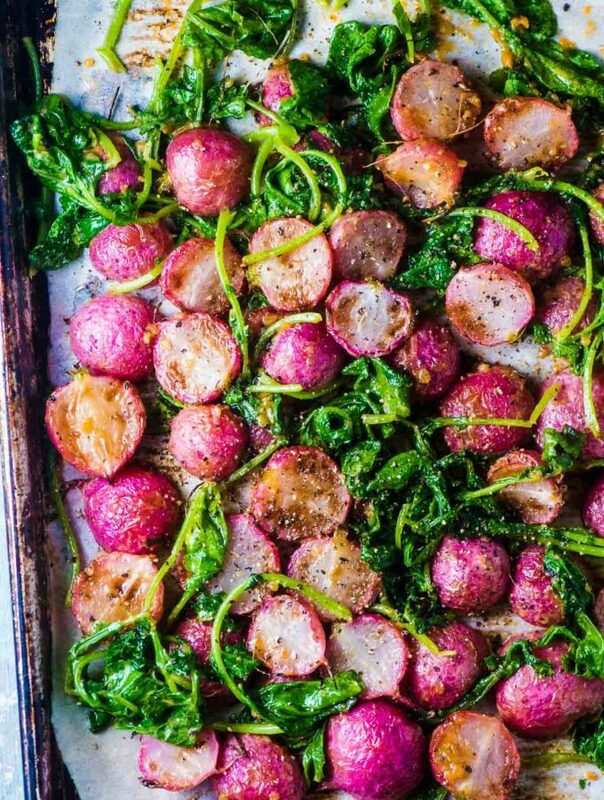 St. Patrick’s Day or not, this meal is going in our rotation. Gosh, you had me at “Chocolate” and “Guinness”. 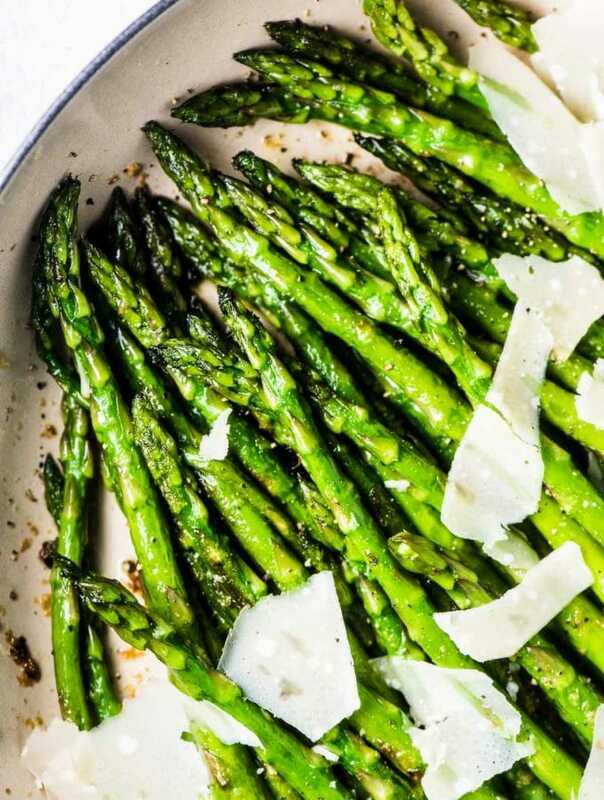 This is one dish I will be trying this weekend. My two favorite things, too! When and how much chocolate do you put I’n? Well that’s a rather important ingredient to have missed. Yikes!! I’ve added it in the recipe now. Thank you for letting me know!